Are you now entering the accounting career the first time and starting with clerical works? 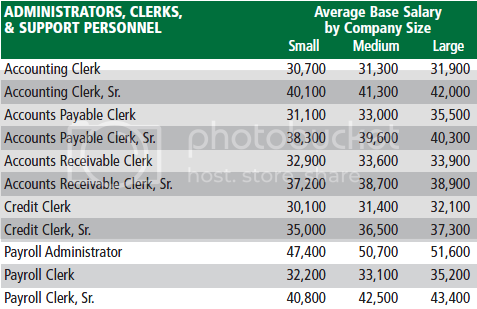 This post may help you in getting rough idea about what clerks do in the real business world. Accounting Clerk performs routine accounting activities such as maintenance of the general ledger, preparation of various accounting statements and financial reports and accounts payable or receivable functions. It requires a high school diploma or its equivalent with 0-2 years of experience in the field or in a related area. Has knowledge of commonly used concepts, practices, and procedures within a particular field. Accounting Clerk relies on instructions and pre-established guidelines to perform the functions of the job. It works under immediate supervision. Small – Based on less than $50 million in annual sales, all industries. This figure represents the national average. Medium – Based on $50-$200 million in annual sales, all industries. This figure represents the national average. Large – Based on greater than $200 million in annual sales, all industries. This figure represents the national average. Accounting Clerk, Senior performs routine accounting activities such as maintenance of the general ledger, preparation of various accounting statements and financial reports and accounts payable or receivable functions. It requires a high school diploma or its equivalent and at least 5 years of related experience. It is supposed to be familiar with a variety of the field’s concepts, practices, and procedures. Relies on experience and judgment to plan and accomplish goals. May lead and direct the work of others. A wide degree of creativity and latitude is expected. Responsible for compiling amounts owed by the company to vendors, suppliers, or other organizations/individuals. Gathers purchase orders, charge slips, sales tickets etc, and prepares payments. Maintains all payment or other transaction records. Requires a high school diploma or its equivalent with 2-4 years of experience in the field or in a related area. Familiar with standard concepts, practices, and procedures within a particular field. Relies on experience and judgment to plan and accomplish goals. Works under general supervision. A certain degree of creativity and latitude is required. Processes and verifies applications for credit and solicits payment on overdue accounts. Compiles necessary information from financial institutions such as banks and credit organizations. Responsibilities also include keeping records of all delinquent accounts, incomplete files, and credit risks. Interviews credit applicant to obtain financial and personal data for credit report. Contacts former employers and other acquaintances to verify references and employment, and investigates credit risk in customers and suppliers. Works under general supervision; typically reports to a supervisor or manager. Maintains production records, timesheets, and payroll system. May be responsible for computing, withholding, and deductions associated with net earnings. May require an associate’s degree or its equivalent. Works under general supervision. Typically reports to a payroll manager. Inputs data from time sheets, production records, or individual time cards to computerized payroll system. Also responsible for balancing payroll runs, producing federal, state and local tax payments, and answering employee questions and troubleshooting issues. Requires a high school diploma or its equivalent with 0-3 years of experience in the field or in a related area. Requires a high school diploma or its equivalent with 2-5 years of experience in the field or in a related area.